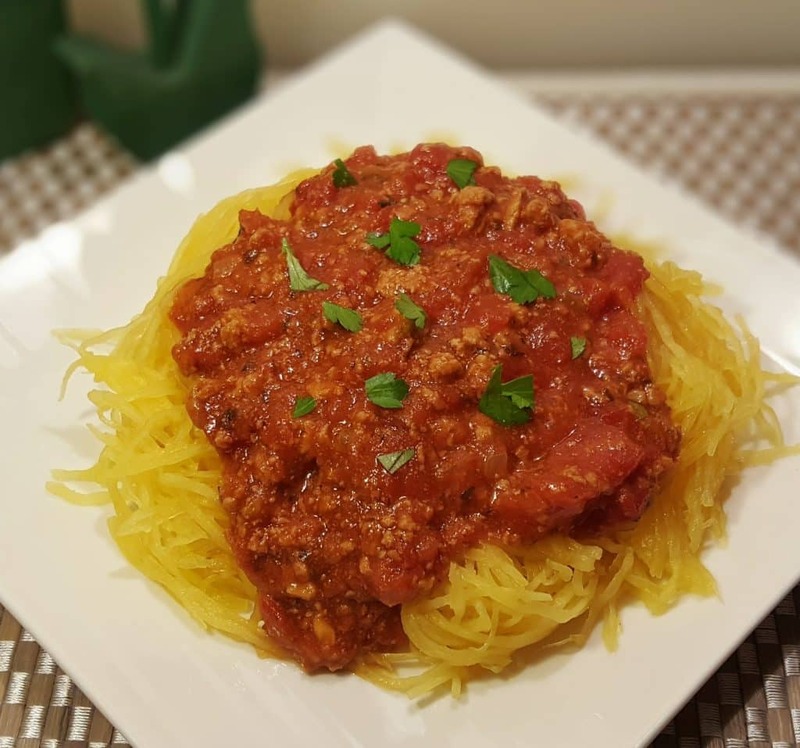 Pressure Cooker Spaghetti Squash and Meat Sauce made totally in one pot will change your life. 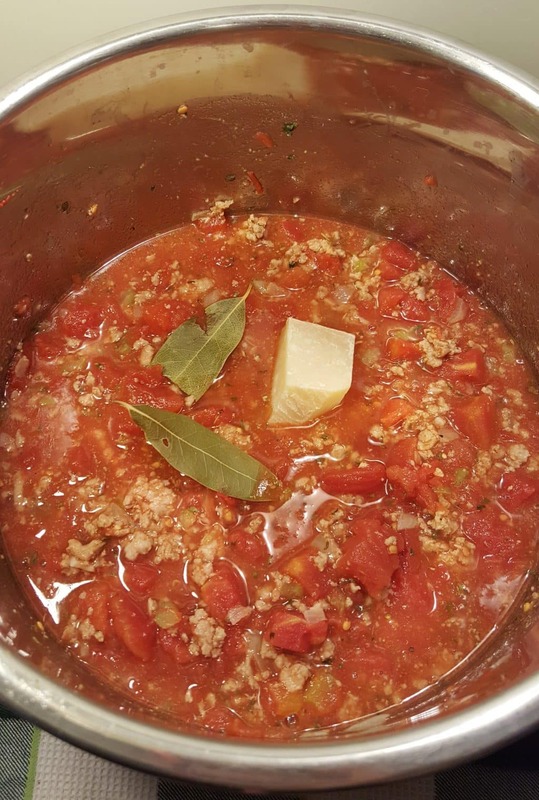 Enjoy a healthy low carb, low fat, low calorie “Spaghetti” and Meat Sauce Dinner! Many, many years ago, I worked as a Make Up Artist in Hollywood. I had just lost a ton of weight and Baked Spaghetti Squash and Sauce made up, probably 75 % of my meals. While working on set, Craft Services would have Spaghetti Squash with Mushrooms and Sauce all ready for me, every day. A huge dollop of Cottage Cheese would be on top! Imagine if they would have used a Pressure Cooker? Sure would have saved them time and room in their Food Trucks. The lead Make Up Artist, Wendy, was a good friend of mine. We met while I was teaching Aerobics at Slimmons, Richard Simmons’ Exercise Studio in Beverly Hills. She was one of my students and we became friends and then started working together. I used Ground Turkey, so the meat is not red and bright, like Beef! Any type of Ground Meat that you prefer, will work well. Next time I might use Beef. The Spaghetti Meat Sauce is a different recipe from my regular Pressure Cooker Spaghetti & Pasta Sauce, so let me know which you prefer. The Beef Stock and Worcestershire Sauce really give this Pressure Cooker Spaghetti Squash and Meat Sauce a real boost. Fish Sauce and Worcestershire Sauce both act as flavor enhancers or Umami, which is the word of the year for flavor. 🙂 Use Diced Tomatoes for a chunky Sauce and Crushed Tomatoes for a smoother Sauce. 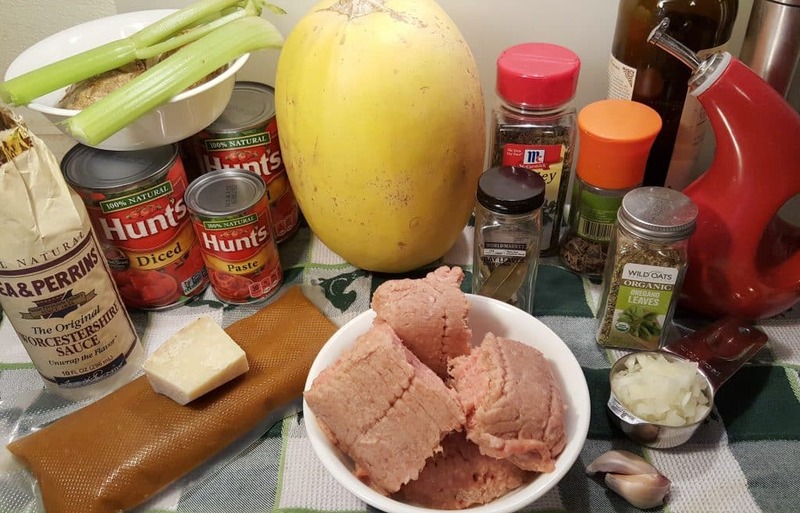 Check out my Pressure Cooker Spaghetti Squash recipe/method for cooking the Spaghetti Squash plain. 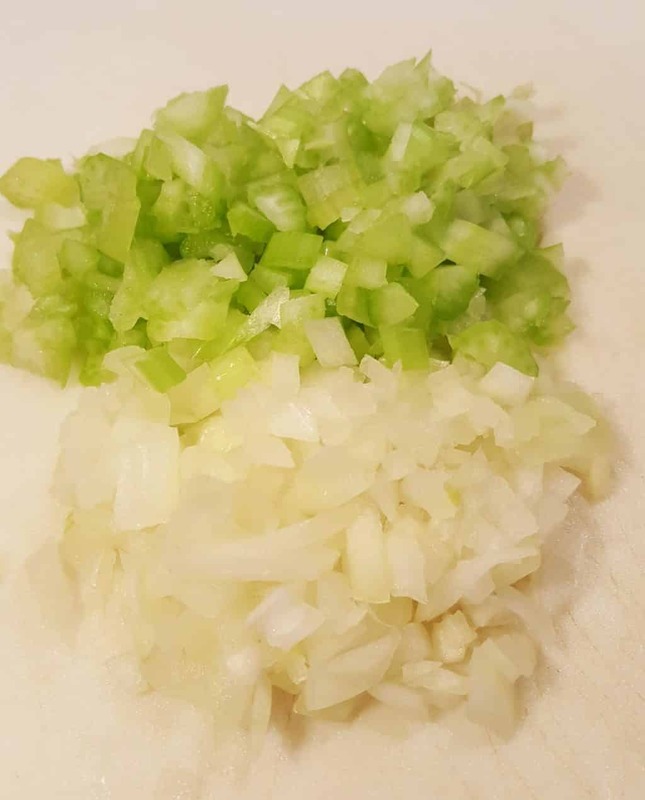 Dice the Onions and the Celery into small pieces. We’ll sauté them with the Meat. If you don’t want to use meat, make this recipe Vegetarian and totally leave out the Meat. 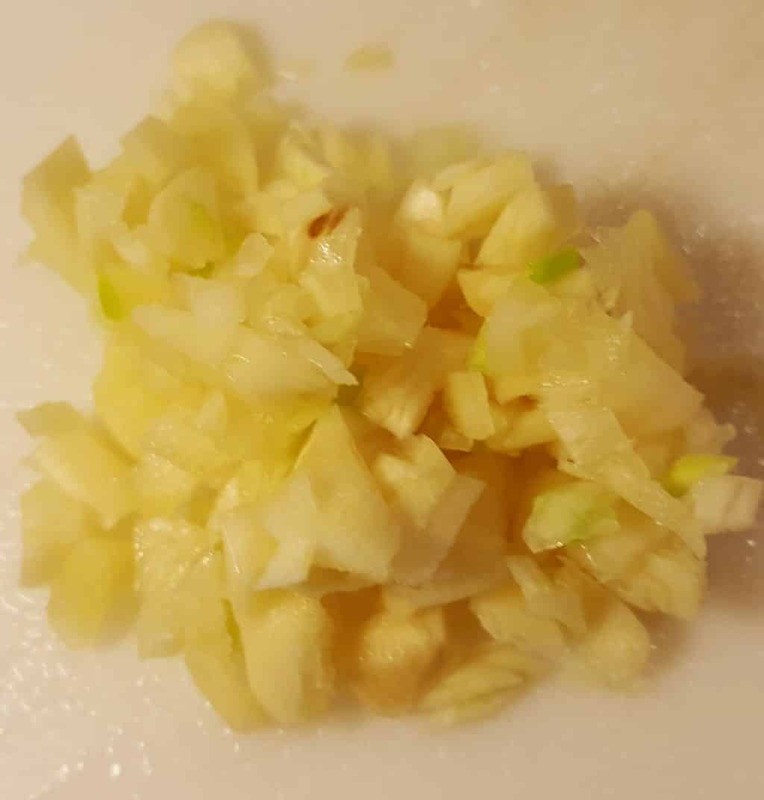 Smash a couple of Garlic Cloves and dice them up well. Please don’t skip this step. 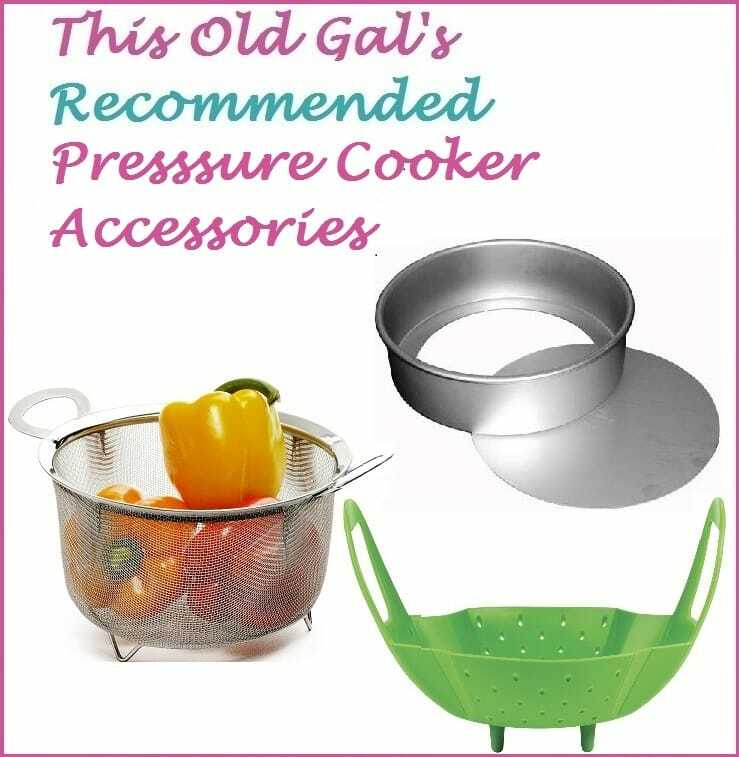 It is the difference between your Instant Pot or Pressure Cooker coming to pressure or getting an Overheat error. Allowing a stainless steel pot to first fully heat, BEFORE adding a fat, will help to make a stainless steel pot, non stick! The same goes for using stainless steel on your stove stop. 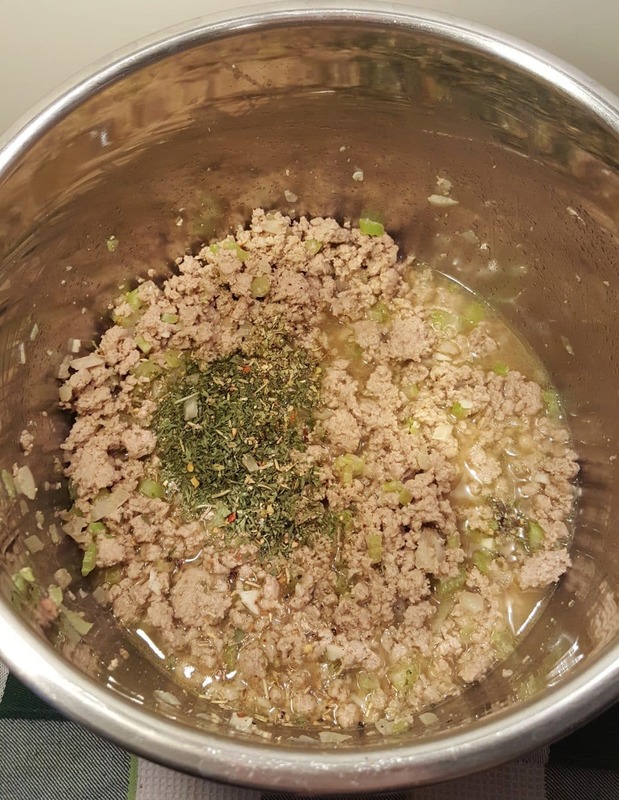 Ground Turkey is much leaner and drier than Ground Beef, so you may need less oil, if you are using Ground Beef. I must admit, however, that I do like the taste of a little Olive Oil in Pasta Sauce. 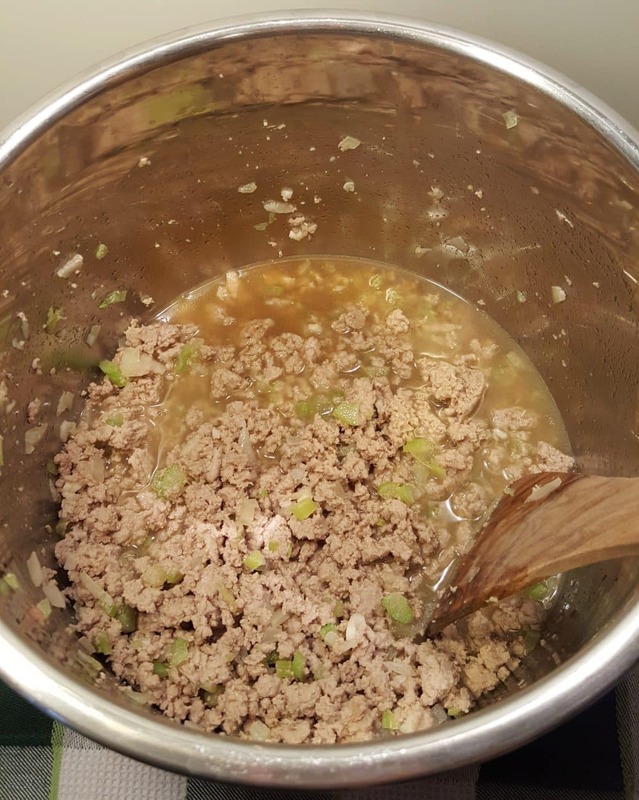 If using Ground Turkey, add an extra Tablespoon Worcestershire Sauce with the Ground Turkey. 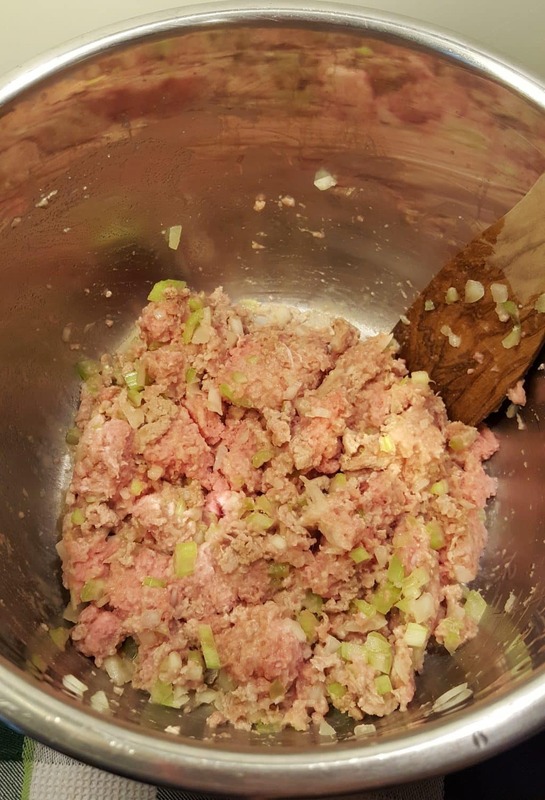 Add the Ground Beef, Onions and Celery to your Instant Pot or Pressure Cooker cooking pot. 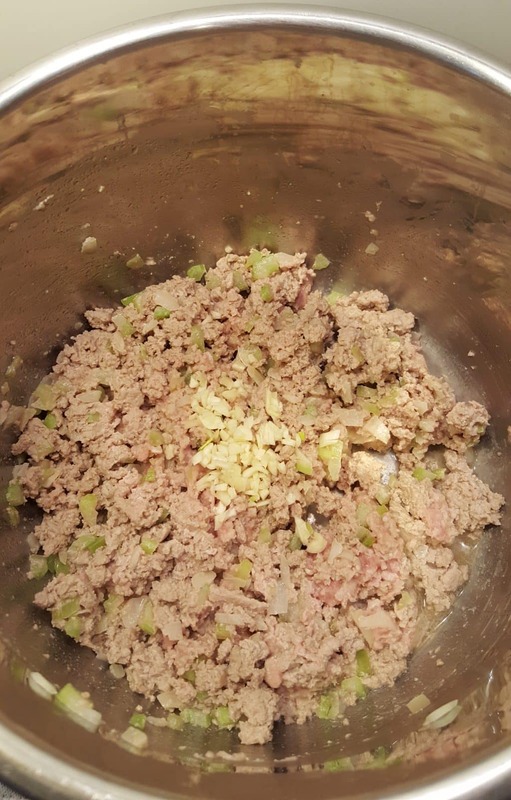 Sauté the Meat with the Onions and Celery, until the meat is nicely browned and the Onions and Celery have become soft. (Remember, I am using Ground Turkey, so the mean is much lighter than beef). Drop in the Minced Fresh Garlic and cook for another minute or so, until the Onions and Celery have become translucent. 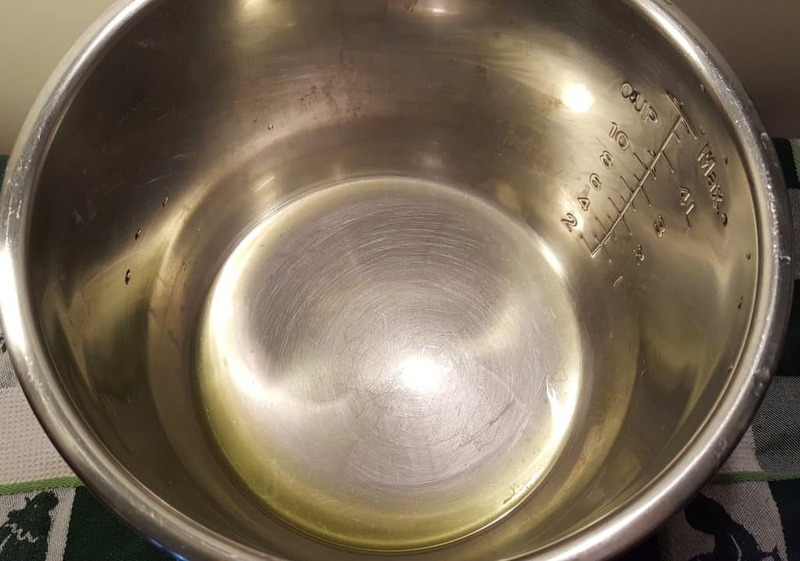 Because of heating the Instant Pot cooking pot first and then adding the oil, you can see that nothing stuck to the cooking pot. Drain off any excess grease/fat. 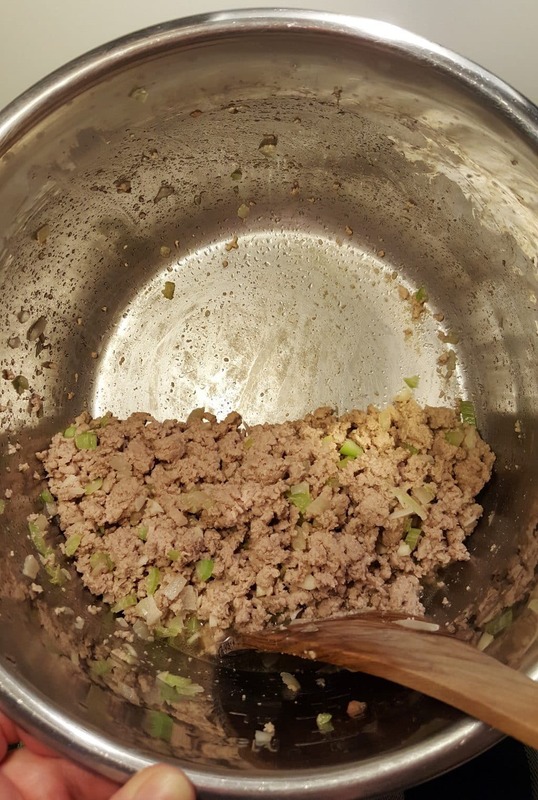 Since I use Ground Turkey, I was not left with much liquid at all and only poured off a tiny amount of liquid. As I said above, nothing stuck to my cooking pot, but, let’s deglaze anyway, just in case. I use my homemade Pressure Cooker Bone Broth, as I keep Chicken Stock and Bone Stock in my freezer. If you don’t have any, premade Beef Broth works well. So, pour in the Beef Broth and/or Red Wine and deglaze the cooking pot. Nothing should be stuck to the bottom. Beef Broth gives a real depth of flavor to this Sauce. Add in the rest of the Seasonings and mix through. If you don’t have all the individual separate Seasonings, just add 2 Tablespoons of any Italian Spice Mix that you have. If you don’t have a Parmesan or Asiago Rind, add in a little grated Parmesan Cheese. Just a bit, not too much. Toss in the Bay Leaves and sink them into the Sauce. Yep, right into the cooking pot with the Sauce. Cooking the Spaghetti Squash whole, will give a better result than first cutting it open. The strands will be drier and more like a baked texture. One Pot Pressure Cooker Spaghetti Squash and Meat Sauce coming right up. Your sauce will taste like it cooked all day, but in under an hour, you will have a complete AND healthy LOW CARB meal. Always make sure your knives are very sharp. Sharpen often. Dull knives are the cause of many accidents in the kitchen. Remove the Spaghetti Squash from the Instant Pot or Pressure Cooker cooking pot and rinse under cool water, so that you can handle the squash. Choose the Sauté or Browning button on your Instant Pot or Pressure Cooker. Add in the rest of the Tomato Paste and allow the Sauce to simmer and thicken. Taste and add more Salt and Pepper, if needed. 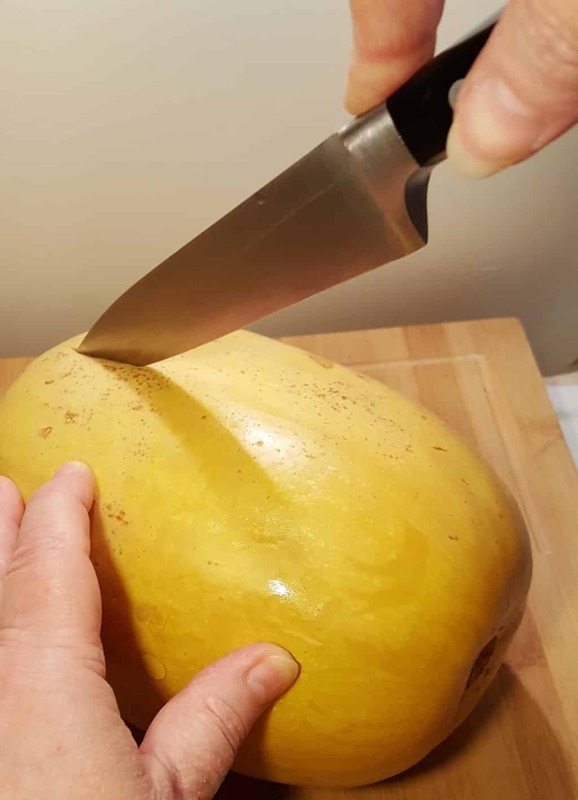 Very carefully, cut and with a sharp knife, the Spaghetti Squash lengthwise. 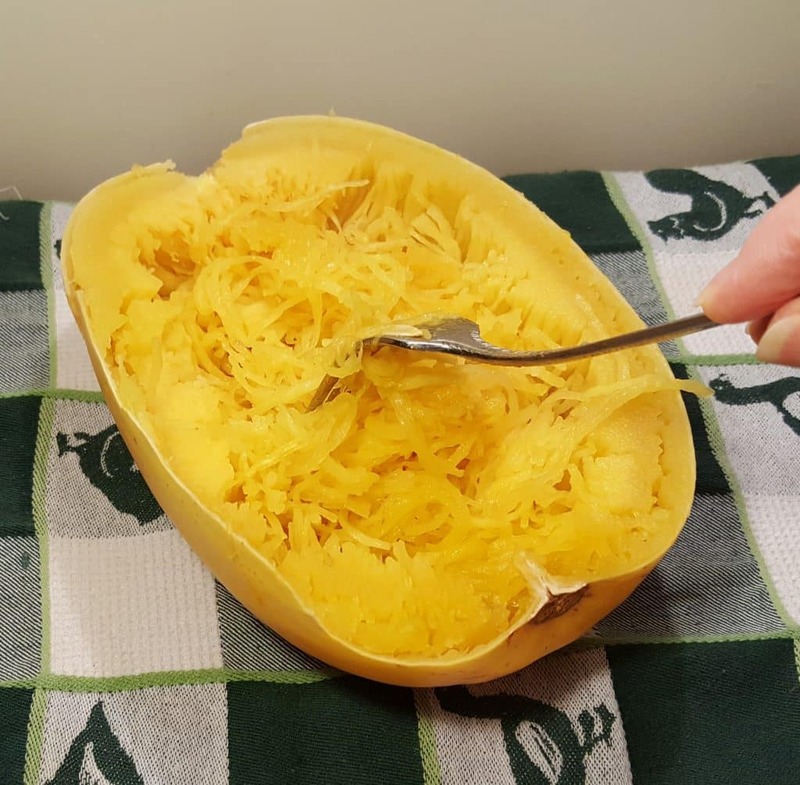 Use a fork or spoon and pull out the Seeds and Guts from the Spaghetti Squash. Save your seeds and check out my Air Fryer Toasted Cinnamon Sugar Pumpkin Seeds recipe. 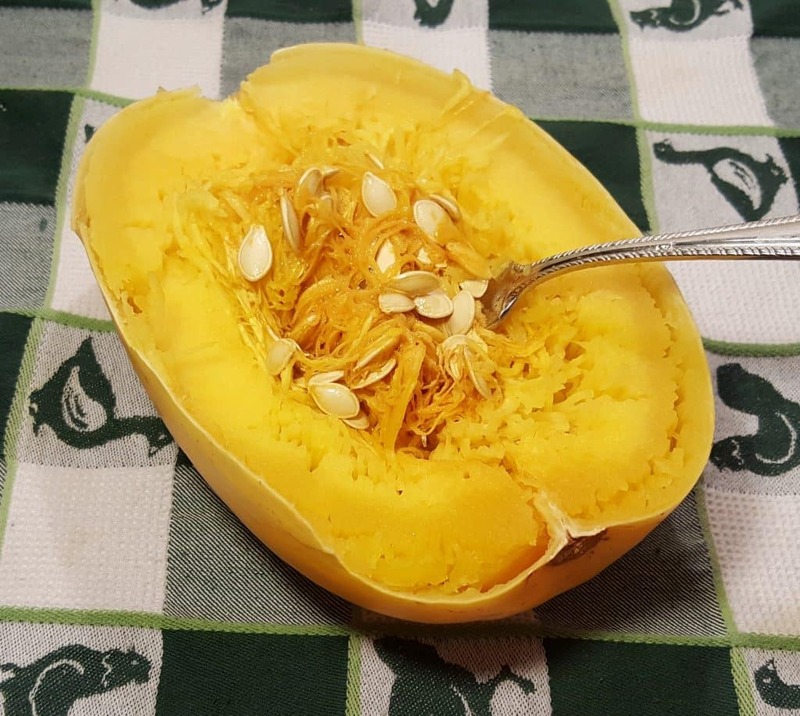 The Spaghetti Squash Seeds are cooked the same way. In that recipe, you first quickly cook the Seeds in the Pressure Cooker. Just skip that step and go to the next! Use a fork and pull out the strands. 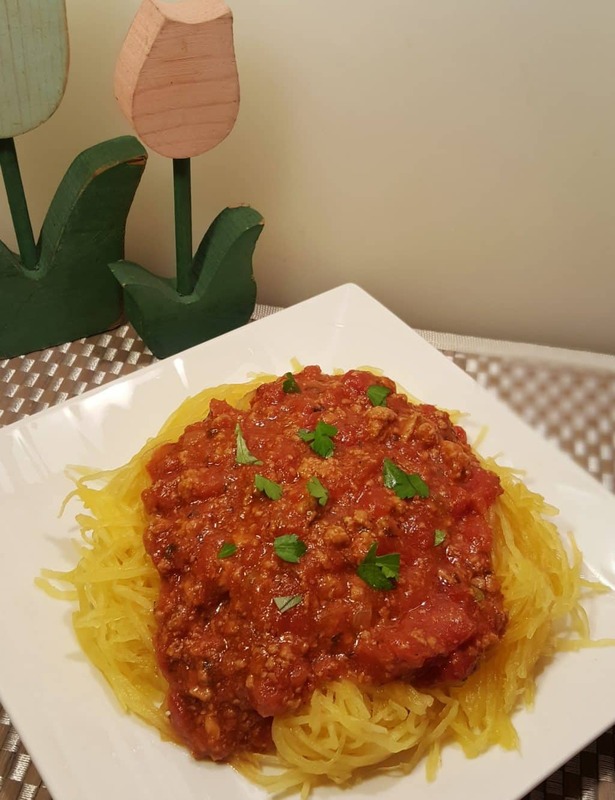 This Pressure Cooker Spaghetti Squash and Meat Sauce is just as good as my Pressure Cooker Spaghetti Squash, but with no carbs and 50% less calories. For those who have family members that do not like Spaghetti Squash, or who are too stubborn to even try it, eh hem, make them a pot of Spaghetti and toss some of the sauce on it. Maybe hide some strands in their Spaghetti. This One Pot Pressure Cooker Spaghetti Squash and Meat Sauce is a very satisfying meal. Top it with some Ricotta Cheese, Cottage Cheese and some shredded Asiago or Parmesan Cheese. Trim Stem and Scrub Spaghetti Squash and set aside. Select Sauté or Browning on your Pressure Cooker cooking pot and allow it to heat. Add Olive Oil to the cooking pot and then dump in the ground beef, onions and celery. Sauté the beef, onions and celery, until they begin to caramelize. Pour out any excess grease. Add garlic and cook another minute. Pour in Beef Stock and Red Wine and mix through, making sure all brown bits have loosened from the bottom of the pot. Add carrots, mushrooms, seasonings, tomatoes, 3 oz tomato paste and all liquids. Mix well. Push Cheese Rind and Bay Leaves into Sauce. Place Whole Spaghetti Squash on top of Sauce. Push down into Sauce, if needed. Lock on Lid and close Pressure Valve. Cook on High Pressure for 10-14 minutes, depending on size of Spaghetti Squash. When Beep sounds, allow a full Natural Pressure Release. Carefully remove the Spaghetti Squash from cooking pot. Remove Bay Leaves and Cheese Rind from Sauce. Select Sauté or Browning, add the rest of the tomato paste and simmer, until the Sauce has thickened. Add Salt and Pepper to taste. Cut Spaghetti Squash down the length and remove the seeds and gusts. Use a fork to scrape the strands. 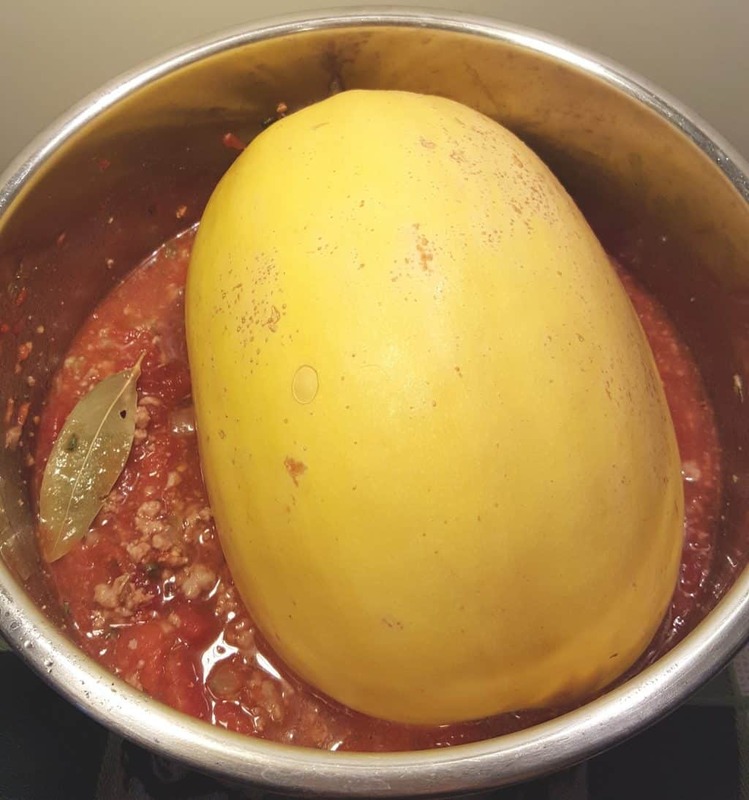 PIN this Instant Pot Pressure Cooker Spaghetti Squash and Meat Sauce! I just made this but had a smaller squash. It was 2.75 pounds. After the 10 minutes under pressure and full natural release, the squash wasn’t fully cooked. Since I cut it open before I realized this, I put it in the microwave to finish up. The sauce is very good. I used ground turkey, added the mushrooms and used a sugar substitute blend because I’m low carbing it right now. Sorry for a 2nd post but this was a huge hit with my husband. He wasn’t thrilled at the thought of spaghetti squash but told me “It’s just like eating spaghetti”. I will make this again. I think my squash wasn’t very fresh and that’s why it needed to cook a bit longer. I couldn’t find when to add the tomato products so I added them after deglazing with stock and wine. I am making this now, and the IP isn’t coming to pressure. I followed the recipe exactly. Concur with Judy – after 10mins the squash was still hard as a rock. Probably 2.5lb squash. Cut it in half, cleaned out the guts and put in for 10 more mins. We’ll see what’s happens after that. Excellent sauce and non-traditional spaghetti with meat sauce. Hubby and I are trying to eat more healthy and lower cal and this was perfect! I did cook the dish with the squash corn 20 minutes and that worked great for me. The sauce turned out great and the squash (2.5 lbs) was very tender. It looked nice on the plate, but I found it necessary to sop up excess liquid released by the squash. In the future, I will probably scoop the squash onto something like a paper towel first to get rid of excess moisture. It is worth mentioning that when my Instant Pot was coming to pressure, the screen changed from ON to BURN. So, I pressed CANCEL, opened it up, and used a wooden flat-edged utensil to go along the bottom to get a few bits loose (nothing had been sticking before, so I was surprised). I then started the program again and right when it was almost at pressure, I got the BURN message again, but this time the message disappeared, went back to ON, and it reached pressure and the timer started. It all turned out and the sauce wasn’t burnt at all, although there was some blackness on the pot that cleaned away easily when I washed it. I’m just mentioning this in case anyone else encounters this. I have an Instant Pot Duo 8 quart. Thank you for this recipe; it is amazing. Both of my very picky eaters (aged 4 and 8), ate every bit of it. So, if a meal tastes great to me but the kids eat it too, well, that’s when I write a review because that’s a win! Small change; I used a jar of Trader Joe’s organic marinara, 6 oz of crushed tomatoes and 2 tbsp tomato paste, instead of all the other tomato products. Just wanted to try and cut the carbs a bit more. So good!!! This recipe is amazing; thanks so much for sharing! I don’t usually post reviews but there is something that set this recipe apart from others: both of my picky eaters (aged 4 and 8), loved it and ate everything on their plates. I did make a small variation by using a jar of Trader Joe’s organic marinara sauce, 2 tbsp of tomato paste and only 6 oz of crushed tomatoes, in lieu of all the other tomato products. I wanted to keep the carbs and acidity (reflux) down as much as possible. Blown away by the fact a whole spaghetti squash can be cooked without having to cut it first. Hate trying to cut raw squashes! So delicious and easy!